We can help you find the prize winners books you are looking for. As the world's largest independent marketplace for new, used and rare books, you always get the best in service and value when you buy from Biblio.com.au, and all of your purchases are backed by our return guarantee. Simon & Schuster, 2001. First Edition. Hard Cover. Very Good/Very Good. First edition. Two light creases on front jacket flap. George Will article on John Adams laid in. 2001 Hard Cover. We have more books available by this author!. 751 pp. 8vo. "In this powerful, epic biography, David McCullough unfolds the adventurous life-journey of John Adams, the brilliant, fiercely independent, often irascible, always honest Yankee patriot -- "the colossus of independence," as Thomas Jefferson called him -- who spared nothing in his zeal for the American Revolution; who rose to become the second President of the United States and saved the country from blundering into an unnecessary war; who was learned beyond all but a few and regarded by some as "out of his senses"; and whose marriage to the wise and valiant Abigail Adams is one of the moving love stories in American history. 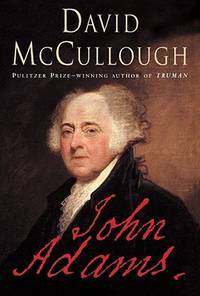 Like his masterly, Pulitzer Prize-winning biography Truman, David McCullough's John Adams has the sweep and vitality of a great novel. It is both a riveting portrait of an abundantly human man and a vivid evocation of his time, much of it drawn from an outstanding collection of Adams family letters and diaries. In particular, the more than one thousand surviving letters between John and Abigail Adams, nearly half of which have never been published, provide extraordinary access to their private lives and make it possible to know John Adams as no other major American of his founding era. As he has with stunning effect in his previous books, McCullough tells the story from within -- from the point of view of the amazing eighteenth century and of those who, caught up in events, had no sure way of knowing how things would turn out. George Washington, Benjamin Franklin, John Jay, the British spy Edward Bancroft, Madame Lafayette and Jefferson's Paris "interest" Maria Cosway, Alexander Hamilton, James Madison, the scandalmonger James Callender, Sally Hemings, John Marshall, Talleyrand, and Aaron Burr all figure in this panoramic chronicle, as does, importantly, John Quincy Adams, the adored son whom Adams would live to see become President. Crucial to the story, as it was to history, is the relationship between Adams and Jefferson, born opposites -- one a Massachusetts farmer's son, the other a Virginia aristocrat and slaveholder, one short and stout, the other tall and spare. Adams embraced conflict; Jefferson avoided it. Adams had great humor; Jefferson, very little. But they were alike in their devotion to their country. At first they were ardent co-revolutionaries, then fellow diplomats and close friends. With the advent of the two political parties, they became archrivals, even enemies, in the intense struggle for the presidency in 1800, perhaps the most vicious election in history. Then, amazingly, they became friends again, and ultimately, incredibly, they died on the same day -- their day of days -- July 4, in the year 1826. Much about John Adams's life will come as a surprise to many readers. His courageous voyage on the frigate Boston in the winter of 1778 and his later trek over the Pyrenees are exploits that few would have dared and that few readers will ever forget. It is a life encompassing a huge arc -- Adams lived longer than any president. The story ranges from the Boston Massacre to Philadelphia in 1776 to the Versailles of Louis XVI, from Spain to Amsterdam, from the Court of St. James's, where Adams was the first American to stand before King George III as a representative of the new nation, to the raw, half-finished Capital by the Potomac, where Adams was the first President to occupy the White House. This is history on a grand scale -- a book about politics and war and social issues, but also about human nature, love, religious faith, virtue, ambition, friendship and betrayal, and the far-reaching consequences of noble ideas. Above all, John Adams is an enthralling, often surprising story of one of the most important and fascinating Americans who ever lived. New York: Henry Holt, 1923. First Edition. Hardcover. Light wear to the corners and faint dampstaining to the very edge of the boards and endpapers. Near Fine, lacking the dustwrapper. J. J. Lankes. Fourth Printing of this, one of Frost's most notable books and winner of his first Pulitzer Prize containing such poems as "Stopping by Woods on a Snowy Evening" and "Fire and Ice." Illustrated with woodcuts by J. J. Lankes. This copy is INSCRIBED "For Roger Williams" and SIGNED by the poet on the title page with one of his most famous first lines, from "Mending Wall" from his collection NORTH OF BOSTON: "Something there is that doesn't love a wall. Culver City, CA: Columbia Pictures, 1954. Collection of 3 vintage black-and-white still photographs from the 1954 film. Mimeograph snipes unattached (but present) from the versos of two of the stills. Based on the Pulitzer Prize-winning novel by Herman Wouk, about a WWII ship captain who is removed from his command, something the US Navy has never experienced, and the consequences of the apparent mutiny. Nominated for multiple Academy awards. 8 x 10 inches (20 x 25 cm). Glue swathes on the versos, else Near Fine. New York: Charles Scribner's Sons, 1993. First Edition. First Edition. The author's most celebrated novel, winner of both the Pulitzer Prize and the National Book Award, and basis for the 2001 film, starring Julianne Moore and Kevin Spacey. Near Fine and unread in a Near Fine dust jacket. Small owner name to the front endpaper, with light fading to the top and bottom of the board edges. Jacket has light fading to the spine and a magnetic safety strip to the verso. New York: Harper and Brothers, 1935. First Edition. First Edition. Winner of both the 1935 Harper Prize and the Pulitzer Prize. Very Good plus in a Very Good, unclipped first state dust jacket. Book has light foxing to the boards and page edges, with toning to two pages where a laid-in newspaper clipping on the Pulitzer Prize win has aged. Rear flap detached from the fragile jacket, and front flap detached, with a few tiny chips at the spine ends. Still a clean, presentable copy. Housed in a custom clamshell box. New York: Limited Editions Club, 1948. Hardcover. Bookplate on the front pastedown. Spine with typical sunning. Near Fine in a Very Good slipcase with a closed split at the back edge. John Steuart Curry. Tall quarto (7-1/8" x 11-1/2") bound in full rough scarlet linen with blue leather labels on spine and front cover. Designed by Francis Meynell and printed by William Rudge. Introduction by Douglas Southall Freeman. Copy #39 of 1500 numbered copies illustrated with oil paintings by John Steuart Curry, his last illustrations for a book, reproduced in offset lithography by Fretz Freres, Zurich, Switzerland. Issued unsigned as the artist died before publication. New York: Harcourt, Brace, 1941. First Edition. First Edition. Winner of the Pulitzer Prize. Just about Fine and unread in a Very Good plus dust jacket. Jacket has light dampstaining and foxing, visible predominantly at the verso, and rubbing to the gilt of the spine. Altogether a sharp, attractive copy. New York: Alfred A. Knopf, 1981. First Edition. Hardcover. Fine in dustwrapper and slipcase. One of 350 numbered and SIGNED copies. Winner of the Pulitzer Prize. New York: Bobbs-Merrill, 1928. First Edition. First Edition, in a later printing dust jacket. Jacket has a different design than that of the first printing, red with black titles and a yellow printed Pulitzer Prize Novel band. Winner of the 1929 Pulitzer Prize and Peterkin's most important book, with dialogue written in the Gullah dialect of South Carolina. Very Good plus in an unclipped second state Very Good plus dust jacket. Light fading to the spine and topstain, with owner name to the second blank. Jacket is lightly rubbed, with mild wear at the extremities. New York: Limited Editions Club, 1962. Hardcover. Fine in glassine and a close to Fine slipcase with some soiling. Jean Charlot. Tall octavo (6-3/4" x 10-7/8") bound in natural buckram with a silhouette frieze of the Bridge's doomed pedestrians stamped in black on both covers, backed in fine imported black morocco leather. Introduction by Granville Hicks. Illustrated with 16 full-color lithographs drawn directly on the plates by Jean Charlot and printed in seven colors. Copy #1470 of 1500 SIGNED by the artist on the colophon page. New York: Frederick A. Stokes, 1926. First Edition. First Edition. INSCRIBED by the author on a pasted-down note to the front endpaper: "For Sydney Williams / With the very best of the author, who wishes he were here in the land of good wines / Louis Bromfield." Winner of the Pulitzer Prize. Near Fine in a moderately restored dust jacket that presents as Near Fine. Light foxing to some of the page edges, with the bottom two corners bumped. Jacket has professional restoration, largely at the spine and corners, with a few unobtrusive short closed tears at the extremities. Difficult to find in any jacket, let alone signed. New York: Farrar Straus and Giroux [FSG], 1989. First Edition. First Edition. INSCRIBED by the author on the title page: "For Paul -- / With songs of love / Oscar Hijuelos." Winner of the Pulitzer Prize and basis for 1992 Arne Glimcher film starring Armand Assante and Antonio Banderas. Foxing to the top page edges, and light toning to the jacket, else Near Fine in a Near Fine dust jacket. New York: The Macmillan Company, 1947. First Edition. Hardcover. Near Fine in a Near Fine dustwrapper and very scarce as such. Michener's first book and winner of the Pulitzer Prize. This copy with the typical browning to the paper though not as bad as usually found. The endpapers and pastedowns at front and rear have some foxing that does not enter the text. The dustwrapper has the $3.00 price horizontally at the bottom of the front flap and is quite bright with just a little edgewear at the corners and spine tips and no tears, chips, or creases of any significance. Difficult to find a better copy. New York: Henry Holt, 1923. First Edition. Hardcover. Mild sunning and rubbing to the spine which has light wear at the tips. Very Good or better, lacking the slipcase. J. J. Lankes. Black beveled cloth, decorated and lettered in gilt. First Limited Edition of one of Frost's most notable books and winner of his first Pulitzer Prize containing such poems as "Stopping by Woods on a Snowy Evening" and "Fire and Ice." Illustrated with woodcuts by J. J. Lankes. Copy #137 of 350 SIGNED by the poet on the limitation page. New York: William Morrow, 1980. Bottoms' first published collection, selected by Robert Penn Warren as the Walt Whitman Award-winner for 1979. Stated first edition (first printing) with full number string. Paperback, color covers. Light general wear, spine creased & faded. Text clean;  pages.. First Edition. Paperback. Good. 5¼" by 8¼". New York: Crown Publishers, Inc., (1996). First Edition. Hardcover. Fine in a Fine dustwrapper. Cloth-backed boards.This story of a young entrepreneur in late-nineteenth-century New York City won the Pulitzer Prize for Fiction. SIGNED by the author on the title page. New York: The Viking Press, (1983). First Edition. printed wraps. Fine and uncommon in this format, especially when signed and in this condition. Uncorrected proof in yellow printed wraps with brown ink lettering and title in ink on the spine. Winner of the Pulitzer Prize. SIGNED on the title page by the author. New York: Henry Holt and Company, (1936). First Edition. Hardcover. Owner name on the front endpaper. Spine sunned. Near Fine, lacking the dustwrapper. A later printing of the First Trade Edition of Frost's third Pulitzer Prize winner. This copy is INSCRIBED and SIGNED by the author on the half-title page to a professor at the University of Texas, Philip Graham, with two stanzas, a total of eight lines, from the poem "A Drumlin Woodchuck," which is included in this volume: "My own strategic retreat/Is where two rocks almost meet/And still more secure and snug/A two-door burrow I dug./With those in mind at my back/I can sit forth exposed to attack/As one who shrewdly pretends/That he and the world are friends. New York: Limited Editions Club, 1948. Hardcover. Spine just a bit sunned, much less than normal. Near Fine in a Good, partly split slipcase. John Steuart Curry. Tall quarto (7-1/8" x 11-1/2") bound in full rough scarlet linen with blue leather labels on spine and front cover. Designed by Francis Meynell and printed by William Rudge. Introduction by Douglas Southall Freeman. One of 1500 numbered copies illustrated with oil paintings by John Steuart Curry, his last illustrations for a book, reproduced in offset lithography by Fretz Freres, Zurich, Switzerland. Issued unsigned as the artist died before publication. New Haven: Yale University Press, 1961. First Edition. Hardcover. Fine in a Fine dustwrapper and uncommon in this condition. Dugan's impressive first book, winner of both a Pulitzer Prize and the National Book Award. Boston: Houghton, Mifflin, 1929. First Edition. First Edition, with "1929" printed on the title page. In a second issue dust jacket, with two paragraphs of text on the front flap instead of four. With the scarce "Pulitzer Prize Winner" wraparound belly band. Near Fine in a Very Good plus dust jacket, Pulitzer belly band Near Fine. Light toning to the spine, else book just about Fine. Jacket has light toning and moderate spotting to the spine, resulting in a couple small pinhead tears. Band also has light toning, especially at the spine, else is about Fine. Franklin Center, PA: Franklin Library, 1981. Hardcover. Fine. Decorated leather. Limited Edition reissue of this Pulitzer Prize-winning story of the relationship between the Roosevelts. Illustrated with a frontispiece. With a previously unpublished message by Lash to his readers and SIGNED by the author. New York: Charles Scribner's Sons, 1958. Hardcover. 186p., introduction, illustrated with a photo of the set by Jo Mielziner, very good first edition in half-cloth with blind-stamp decoration over boards in dj with price intact. Pulitzer prize-winning play. Chicago & London: The University of Chicago Press, (1977). First Edition. Hardcover. Fine in a Near Fine dustwrapper. INSCRIBED and SIGNED on the title page to poet William Meredith: "for Bill/with much affection/Howard/17 V 78." Winner of the Pulitzer Prize and the National Book Award.